SPRINGVILLE, Ont. 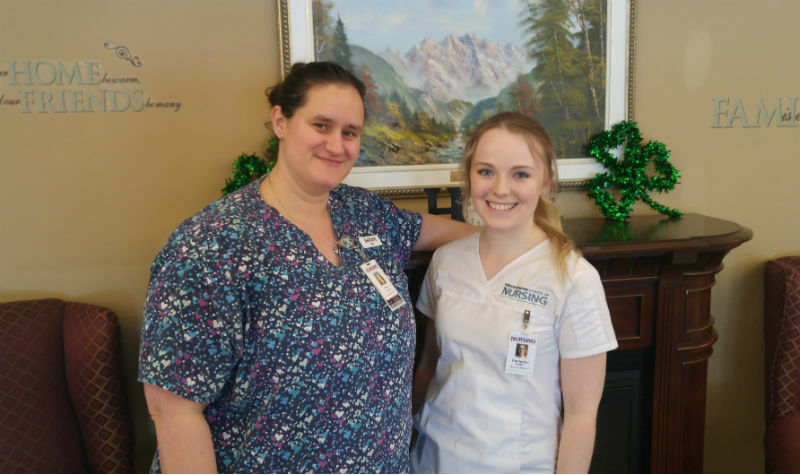 – Katherine Ledlie plans to become a pediatric nurse when she completes a nursing degree at Trent University, but she says doing a placement at Springdale Country Manor has been the perfect starting point for learning hands-on care. Katherine is one of a group of nursing students from Trent doing a placement at the Peterborough-area long-term care home. The students are in the second semester of their first year, and this is their first clinical placement. Students are mainly learning about the work personal support workers (PSWs) do. Katherine says she and the other students started their placement at Springdale without any hands-on experience working with people. While Katherine says she didn’t know what to expect working with long-term-care home residents, the experience has been enriching. “My ambition still is to go into pediatrics, but I kind of went into this thinking I wouldn’t like it, but I actually do really enjoy the time here,” she tells The OMNIway. Katherine says residents have been receptive to the care she and the other students provide. Currently, two groups of eight students are coming to Springdale twice per day, from 7 a.m. to 1 p.m. and from 1 p.m. to 7 p.m., on Mondays and Tuesdays.